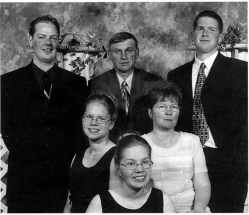 Together, Wade and Janice have four children: Emil Wade, born May 2, 1977; Bradley James, born March 20, 1978; Stacey Lynn, born August 25, 1982; and Chrystal Margaret, born June 22, 1984. All children went to school at Erickson Elementary and Erickson Collegiate, and were baptized and confmned into the Erickson Lutheran Church. As a child, Emil was involved in many sports, espe­ cially hockey and swimming, and in high school he took part in the team sports as well. He also took piano and guitar lessons. Emil graduated from high school in June of 1995. In 1998 he purchased an Asian food restaurant in part­ nership with two other men, which was open in Onanole during the past two summers. Emil completed his appren­ ticeship earning his Red Seal (chef certificate) in 1999. At the present time he is working in Winnipeg as a chef. Bradley enjoyed soccer, hockey and swimming as a child. In high school, Bradley participated in school sports, and took part in a few drama productions. Since graduat­ ing in June of 1996, Bradley has been working on the farm taking care of the livestock and fields with his father. Along with farming, he works for Purolator on a casual basis. Stacey began skating at age three and took lessons until she was about II years old. She is now in grade twelve and is involved with school sports, student coun­ cil, drama, church and the yearbook committee. She has passed her grade five piano and her preliminary theory exam. In June of 1999 she traveled to Ottawa, Montreal and Quebec with the school's grade eleven and twelve French class. has passed her grade 1 theory exam. She also is in the school band, playing the flute. In June of 1998 Chrystal went to Churchill with her class and in July of 1998 she went to Halifax with the Erickson Lutheran Church Praise Group. On August 26, 1924 Emil Shellborn, youngest child of Amanda and Magnus Shell born, and Esther Eastland were married in Newdale, MB. They lived in Erickson and their first child, Frances, was born in the Rural Municipality of Clanwilliam in 1925. 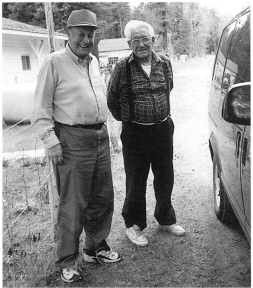 The family moved to Wardner, BC where Emil worked at various jobs. Their family increased with four more children, Ruby, Doris, May, and Daryl. In 1947 they moved to Jaffray, BC. Emil continued working until his retirement in 1969. Miles did not keep them apart from acquaintances in the Erickson district. Visiting with the Shellborns, they enjoyed remi­ niscing about the people they knew in Manitoba. Emil could always recall good old-time stories. Esther and Emil celebrated their 60th wedding anniversary in 1984. Esther passed away April 25, 1987. Their daughter, May, passed away in infancy and their daughter, Frances, passed away from cancer. Editor S Note: Emil passed away April 22, 2000.